UberTwitter Beta 5 integrates with TweetPhoto | BlackBerry Blast! UberTwitter is a favorite Twitter client among BlackBerry users and they aren't resting on their heals. Beta 5 of the popular Twitter client includes several bug fixes, and introduces an integration with TweetPhoto. UberTwitter had already partnered with TwitVid so users could upload videos, and now they have a partnership with TweetPhoto for photo handling. "We chose TweetPhoto as our default photo service because we wanted to give our users the fastest, easiest and most reliable photo service available," said Paul McDonald, founder of �berTwitter. "From a user-experience standpoint, TweetPhoto offers the richest experience to our users. 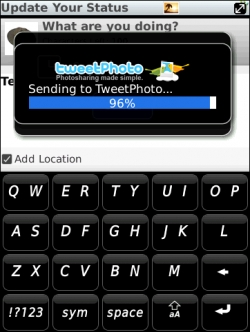 And from a developer's perspective, TweetPhoto's API is extensive, reliable, and extremely easy to integrate." UberTwitter comes in a free, ad supported version, as well as a paid version for $4.99.